When the night goes down in the city, the Segways come out, and the city comes alive. Explore the intimacy of a night tour on this fully narrated Little Italy, Chinatown, Embarcadero Waterfront and Waterfront Segway Tour. See fabulous night views of the new Bay Lights installation, the Transamerica Pyramid, Coit Tower and the Ferry Building. This is a fully narrated 2.5 hour tour where you will be supplied with radio earbuds so you will not miss a word. 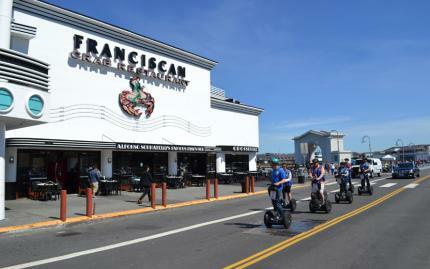 The tour will cover everything from Washington Square Park, where you and fellow Segway riders will learn about the authentic Beat Generation in North Beach, to the Ghirardelli Square, where you will uncover more about the famous chocolate that bears its name. Learn how cable cars operate, view the unique streamline design of the National Maritime Museum and so much more. Stop boring yourself with walking everywhere and hop on a Segway! Note: All participants must be age 12 and up and over 100 lbs and under 250 lbs. There will be no weight exceptions; a scale will be used to check guest weights. Guests under 18 years of age must be accompanied by a parent or guardian. Pregnant guests are unfortunately not allowed on the tour due to fall risk. Cancellation notice must be provided at least 72 hours in advance in order to receive a full refund. Tours run rain or shine. In the rare case of tour cancellation, you will be allowed to reschedule.